In sparkling glitter-knit jersey, this short holiday dress is an eye-catching design for Christmas parties, New Year's Eve events, and cocktail hours. 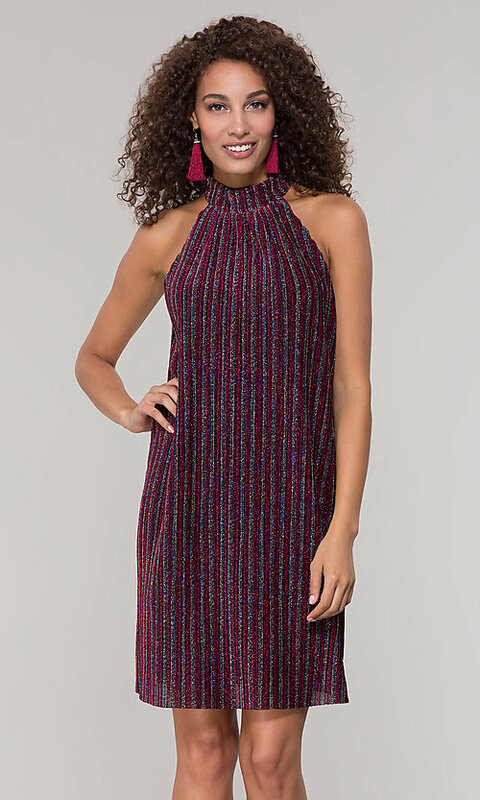 Visually slimming with vertical fuchsia pink and glittering stripes, this short shift dress flares away from the midriff and hips to flatter the figure. 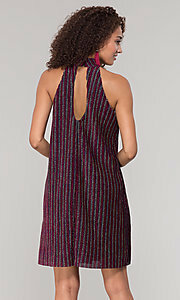 A contemporary design, the sparkling short striped dress features cut-in shoulders and a high-neck collar that circles the neck to connect above a bold keyhole cut-out detail. If you're going to wow the crowd, do it right in this fuchsia pink striped short holiday dress, under $100, that proves that an impressive look doesn't have to cost a fortune.